Looking for website design tips for better photography? Here are 3 easy-to-implement ideas! The quality of photographs on your website directly influences the purchasing decisions of your visitors. In fact, 70% of consumers’ buying behaviors are affected by a site’s images. A successful website needs to look successful! The good news is that quality digital photography is now more affordable than ever. 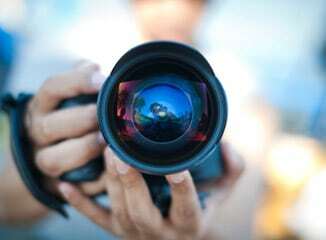 While this doesn’t mean that a professional photographer has become expendable—in many cases their contribution is vital to capturing the needed image—the quality achieved with high-end digital cameras has also been well established and utilized by small and large businesses alike. 1. For exterior shots, look at where the sun hits throughout the day. Your best shot will be either during the early morning hours or late afternoon. 2. People like to see other people working not posing. Stay away from having employees or customers looking into the camera. Your audience has a better chance of relating to what is happening if everyone is not looking directly at them. 3. Learn some basic applications of Photoshop Limited, especially color saturation and contrast. With a little adjustment of these two features, even a sub par visual can look a little better.